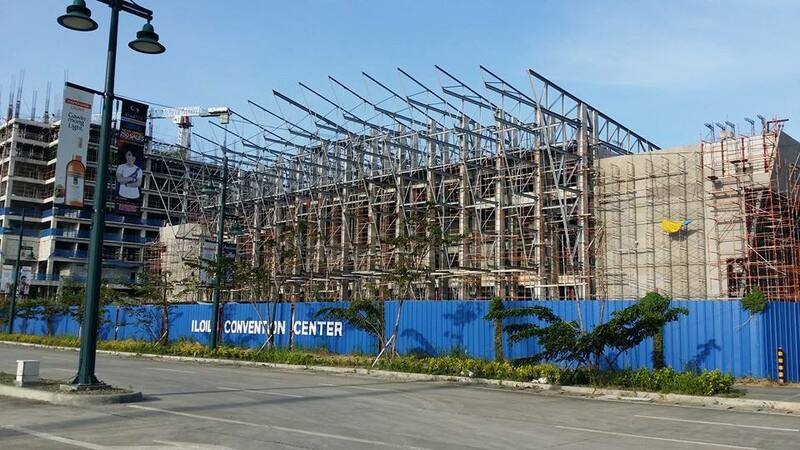 It’s been three months since the last meeting in the Iloilo leg of the APEC 2015 was held at the Iloilo Convention Center, but the grossly overpriced building — originally estimated to cost only P200 million — is far from finished. I went to the ICC myself on January 4 to see what’s inside the concrete and glass cavern sitting between two hotels of the Megaworld Corp. I am thankful that the young administrator graciously allowed me to tour the building, accompanied by a private security guard as guide. And what I found inside the building depressed me even more. After the DPWH and TIEZA spent nearly P750 million, the ICC is not 100% completed. The contractor, Hilmarcs Construction, is still awaiting a new P55 million contract to install the folding walls to allow the main hall to be divided into five smaller meeting venues. Both inside and outside the building, work items remain unfinished, including the parking lot and security guard post. There’s nothing in the building that would justify the expenditure of P800 million when it is finally completed long after the APEC meetings which was the justification for its construction. That’s right, the final price tag for the ICC once it is completed is P800 milliion, and that’s without the sound and lights system that was scrapped last September. In fact, a number of people who have attended conferences at the ICC since it accepted space rental are one in saying that it is definitely not world class. There’s a consensus that it fell far short of expectations from the way it was described by its patron, Senate President Franklin Drilon. As one recent visitor told me, even the restrooms are substandard for a facility that is branded as “world-class”. She described the quality of the restrooms as just about par with the restrooms of a two-decade old mall in Lapaz. She said she is embarrassed by what she saw. It was damning evidence that much of the money spent for the project was carted away in a long convoy of armored trucks. I don’t know if Drilon still has an iota of conscience left in him and confess his sins to the Filipino people. This is public money we are talking about here through the Development Acceleration Program (DAP) that the Supreme Court had declared as illegal and unconstitutional. It’s not just the ICC that has become a monument of Drilon’s corruption. The still unfinished Benigno Aquino Jr. Avenue, or more commonly known as the Iloilo Diversion Road, has cost about P150 million per kilometer for a 6.25-meter widening with the ridiculous pave-tiled “bike lanes”. From the foot of the Iloilo Bridge going to Ungka — a distance of about 5 kilometers — is already costing us about a billion pesos. And it’s not just outrageously overpriced. The quality of work on the road pavement is poor. Driving along the Diversion Road is like riding a boat in turbulent seas. That’s because the road surface is uneven. Those LED street light are another scandal. Based on computations I made from the contracts awarded for their installation, each street light would cost P1 million. Drilon must have learned from his cousin, Jed Patrick E. Mabilog, who overpriced traffic lights by as much as 300%. And to make sure all the evidence to these anomalies remain buried, Drilon has arranged for DPWH regional director Edilberto Tayao to get another six months extension after his one-year extension expires next month. Drilon needs to keep Tayao in the DPWH regional office because it’s only the soon-to-turn 67 years old regional director who has the gall to execute the corruption-ridden projects. Tayao has only recently undergone a major heart surgery, and he should already be avoiding stressful work by going into retirement. It’s not as if DPWH lacks competent officials who can replace Tayao if qualification and capability are the sole basis. But it’s not. It’s about the willingness to carry out the corrupt deals of the Senate President. I know it’s useless to be filing more cases against Drilon over these projects for as long as President Benigno Simeon C. Aquino III remains in power. Perhaps under a different dispensation, Drilon and his accomplices can be held to account for their misdeeds. Having said that, the likelihood that Drilon will follow the footsteps of his fellow senators to jail is increasing everyday as survey after survey shows that the Liberal Party standard bearer, Mar Roxas, is sinking deeper into oblivion. At the moment, I derive consolation from the knowledge that Drilon is facing a jury composed of Ilonggos who witness the ugliness of corruption that he has brought upon Iloilo City. More and more Ilonggos are expressing their disgust over Drilon’s immense appetite for pork and the corruption it entails. And in the end, it will be God who will judge Drilon. When that happens, there will be a lot of pork lard to drip when this king of pork is roasted in hell. After spending two months in San Pedro City, Laguna as guest of Kap Jun Ynion, I saw concrete proof that “zero corruption” does translate into better public services and greater efficiency in governance. Like so many others, I threw my full support into the “matuwid na daan” slogan of President Benigno Simeon C. Aquino III when he assumed office on June 30, 2010. It didn’t take long before the enthusiasm wilted and was replaced by disillusionment. Corruption remained rampant despite the filing of graft cases against three senators. Worse, the Aquino administration cloaked its allies, who were as voracious in plundering the national treasury, under a mantle of protection. God knows how hard I fought to expose massive corruption in Iloilo City, filing cases against the Senate President and the City Mayor. I also inundated the Commission on Audit with requests for vital documents. In the four years I mounted that battle, I was met only with frustration. Tthe Office of the Ombudsman under its new head, Tanodbayan Conchita Carpio-Morales, does not seem eager to indict the respondents, not for lack of evidence, but simply because they were pro-Aquino. It reached a point when I was ready to throw in the white towel. There is no way we can lick corruption. Our nation will drown in it, I told myself. But watching how Jun Ynion translated the “zero corruption” advocacy into a working model in Barangay San Antonio opened my eyes to a new possibility for my own mission. Instead of fighting corruption and be beaten by the system, here’s an opportunity to push “zero corruption” and persuade the people to embrace it. This requires less energy because the emphasis is on the positive. Because of his position as the local chief executive of the barangay, Kap Jun didn’t take long in dismantling the remnants of corruption from the previous administration. It wasn’t an easy ride; he encountered heavy turbulence in the first six to 12 months. Kap Jun wields strong political will, and he was able to remove the infrastructure, including people, that bred the corruption. Now Kap Jun is focused on proving his point: that with zero corruption, every peso in the public treasury can be used to maximum effect. All goods and infrastructure are procured at the lowest cost. Overpricing is taboo, and not a few employees of the barangay had to learn this the hard way — the lost their jobs. Barangay San Antonio was the second biggest barangay in San Pedro City, next only to Barangay San Vicente, when Kap Jun came to office in November 2013. It has an annual budget of P35 million to serve 70,000 constituents. The amount may seem big for a barangay, but then Barangay San Antonio has a population equivalent to a mid-sized municipality. I’ll skip the details of what Kap Jun has done for Barangay San Antonio. But it dawned upon me that the battle against corruption can be pursued — I believe with greater potency — by demonstrating that it promotes the welfare of the people and enable government to do more for less. Indeed, history teaches that the greatest causes were won not with hostile activities, but more on the foundation of love and understanding. It’s about winning the hearts and minds of the people. This was how Christ taught his disiciples, who in turn spread His word. So, too, did Mohammad. Mahatmi Gandhi didn’t bring the British to its knees by leading a violent revolution; he advocated non-violent resistance. Hence, as a journalist, I made up my mind to change my approach to the problem of corruption. I’ve seen that hurting our officials with exposes on their corruption didn’t change the way they went about their business. It is effective in attracting readership. However, the readers are not moved to action by the scandals they read. It’s as if nothing happened after they put down their newspapers or shut down their computers. From now on, I will channel my energies to writing about success stories on corruption-free governance. Not all politicians are bad. We need to reinforce the core values of the good politicians by making them feel their brand of leadership is appreciated. Hopefully, the idea will spread, and more politicians will seek more of the public approval than gain the scorn of the people. This doesn’t mean I will abandon my cause against corruption. I will continue to carry on as a watchdog. But it will be more on a positive tone. In Toastmasters, I learned that criticism can be made more palatable by couching it in pleasant language. Once you tell a person, more so a public official, that he did a something wrong, it’s likely he will put up a defensive posture and thwart the message. I’ll “suggest” to them how the law might apply to specific anomalous transactions and gently nudge them to rectify their actions. In essence, I’ll shed off the image of a fault-finder, always ready to pounce with a dagger. This will be replaced with the image of a coach, understanding that mistakes can be made and giving our officials the benefit of the doubt as to their motive. After all, nobody is perfect. There is always room for improvement. I feel encouraged with this paradigm shift. There is already one instance when Mayor Jed Patrick E. Mabilog canceled a contract which I pointed out was legally infirm. Next time, I’ll remove the hostility in my commentary to lessen the resistance to the message. Perhaps we will be able to see less transgressions of the law, particularly the procurement law. On the Iloilo Convention Center, I’ve done enough. I have delivered the message about the anomalies that transpired. The case, upon a motion for reconsideration, is pending with the Office of the Ombudsman. It was a Quixotic crusade. Now that the ICC is being rushed toward completion, I will keep quiet about it. I don’t want to put more pressure on our DPWH. The career officials are always the ones caught in the middle. I’ll give them room to finish the project. I’ve made my point, and I will let the judicial processes take its course. Meanwhile, there’s plenty of work as I embrace this paradigm shift with Kap Jun Ynion. He has embarked on a courageous journey to change politics in San Pedro City. As a loyal friend, I will help him in every way I can to succeed in his mission. After all, we share a passion for good governance and scorn for corruption. An ICC on a silver platter? Is the Iloilo Convention Center going to be offered to Megaworld on a silver platter? This question has occupied my mind since I received a letter from Atty. Joy M. Bulauitan, Assistant Chief Operating Officer of the Tourism Infrastructure and Enterprise Zone Authority (TIEZA), last week informing me that the agency conducted two biddings for the management of the ICC, and that both resulted in failed bids. Yesterday, I wrote Atty. Bulauitan another letter asking whether TIEZA intends to conduct a negotiated bidding for the contract, which is the logical move after two failed biddings. There seems no hurry now on the part of TIEZA to find a private sector partner to operate the ICC. Why is this a cause for worry? That’s because the Deed of Donation between Megaworld and DOT stipulated that the management of the ICC shall be awarded to a private entity. If the TIEZA fails to find a management contractor, then DOT/TIEZA will be in violation of the contract of donation. I am not a lawyer but I know enough law to understand that failure of one of the parties to perform any one of the conditions could be ground for rescission of the donation. If the contract is rescinded on this account, the entire ICC will go to Megaworld as donor. Heaven forbid, but this is the sweetest sweetheart deal that could possibly happen between Senate President Franklin Drilon and Megaworld. Without working up a sweat, Megaworld will have a convention center on its laps, courtesy of the government. Anytime soon — if it hasn’t happened yet — the Tourism Infrastructure and Enterprise Zone Authority (TIEZA) will award the management contract for the soon-to-be-finished Iloilo Convention Center at the Iloilo Business Park of Megaworld Corp. in Mandurriao, Iloilo City. The management of the ICC, which is expected to be finished at a “reduced” budget of P679 million by late June this year, is one of the conditions set by Megaworld when it donated the 1.7-hectare lot to the Department of Tourism as site of the facility. And guess who will be the ultimate contractor to manage the ICC? No other than Megaworld Corporation. It will be a classic case of Megaworld having its cake and getting to eat it, too. It donated land which it bought at P2,500 per sqm. between two of its five-star hotels, Richmonde Hotel and Marriot Inn. Its act of “generosity” will reap enormous returns because it will now have a convention center at no cost to the company. This was made possible, of course, by its benefactor, Senate President Franklin Drilon, who packaged the transaction that would cost the national government a whooping P679 million! It is a scam that is not likely to be investigated in earnest until a new administration comes along. As it is, Drilon enjoys the full protection of the “matuwid na daan” President, Benigno Simeon C. Aquino III. Hence, Megaworld will get the better end of the bargain when the ICC is completed, one that will be the envy of other big developers like SM and Ayala. It gave DOT a design for the ICC and it is getting it at no cost. All it needs to do is making a semblance of giving government a share of the income. With the ICC, it can market its two five-star hotels as venue for large national and international conventions. It is being handed over by the DOT on a silver platter. The graft cases I filed against Drilon et al are now in the final evaluation stage in the Ombudsman. Am I confident that the Ombudsman will hold the principal characters culpable for the litany of violations of the government procurement law and anti-graft and corrupt practices act? Ultimately, the Ombudsman will be compelled to charge them. But maybe not soon enough. The Ombudsman is pre-occupied with running after the Binays. The facts, and the law, are on my side. That’s the reason I can confidently say the Ombudsman will ultimately indict the respondents. The violations of law and policy are so glaring, and the defenses put up by the respondents have been weak. Most of them attacked me for supposedly saying I had no evidence when I appeared before the Senate Blue Ribbon Committee four months ago. Unfortunately for them, it’s not what I said that matters to the Ombudsman. It’s the evidence on the record. In this case, I was able to turn the table around and used their own documentary evidence against them. This is the beauty of the law. Innocent-looking documents submitted by your opponents can prove more lethal to them. I take great pride in waging this battle because I was pitted against the best lawyers in the country. For a non-lawyer, it flatters me to be able to cause seasoned lawyers consternation and great labor. There’s nothing I can do to stop the transaction. Drilon, in his speech during the Dinagyang, arrogantly boasted that no Ilonggo can derail his pet project. Of course, it wasn’t the project that I intended to stop. It was the wanton plunder that took place in the guise of implementing the project. I am now just awaiting the Regional Trial Court of Pasay City to set my arraignment on the four counts of libel that Drilon filed against me. Facing Drilon’s libel charges against me is the greatest challenge ever to confront me. But I am not afraid. I know I am in the right. In the end, truth will triumph, and justice will be mine.